ALBUQUERQUE, N.M., Jan. 6, 2017 /PRNewswire-USNewswire/ -- With a few glances of his eyes, Erik can hop on social media to post a picture or surf to YouTube to play the latest Wu-Tang Clan video. He also can better communicate with the loved ones who are part of his daily routine. 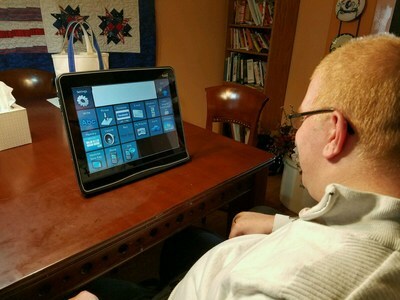 Technology helps Erik live a life comparable to any young man across America. He almost didn't have this opportunity. More than 11 years ago, a bullet fired by a sniper in Iraq struck Erik's head, leaving him paralyzed. Erik was just 21 years old at the time. While doctors recommended a nursing home, his parents decided they would be his caregivers, sacrificing their personal lives to ensure Erik would have the best life possible, instead of spending all his time with senior citizens. Early in Erik's recovery, Wounded Warrior Project® (WWP) stepped in – greeting Erik at his hospital bed with a backpack containing simple items: shorts, a T-shirt, toiletries. But WWP also offered a promise to be there for him when he returned home. In 2011, WWP launched the Independence Program to help our nation's most severely wounded veterans. These men and women, like Erik, have suffered mild to severe traumatic brain injury (TBI), spinal cord injury, or other neurological conditions. The Independence Program works with each warrior, his or her family and caregivers, and a case manager to set individual goals and develop a plan to meet those objectives. Therapists and a case manager meet with Erik to help him on a daily or weekly basis. "We figured out what Erik was missing that he used to enjoy," said Christine Schei, Erik's mother. Erik's injuries limit his ability to socialize, but through the use of technology, he can interact with friends over social media. A special device reads Erik's eye movements as he faces a digital keyboard. It then makes words from what he spells and can read those back – or post online. "If he wants to go on YouTube or talk with his battle buddies, the technology makes it possible," Christine said. "He can also activate a camera connected to the device, take a picture, and then post it online." Additionally, the technology helps his recovery through a memory game that tests cognitive ability. Erik also works with other electronic equipment on a regular basis. He uses a stand-up harness to maneuver him into a standing position. "It is great for his balance, and it is weight-bearing, so it also helps with his bones because he does not move around regularly." He uses an adapted four-wheeler to get around outside and is now able to use it to enjoy another favorite pastime – hunting. "We found a company that created something with a digital screen to target; then he can use his breath to fire a mounted gun." Erik has already put that to use. "He got an antelope back in October." Christine is constantly looking for other technology to help Erik live a more regular life. A return to other hobbies is also helping. "Through the Independence Program, Erik is now starting to get back into art. He used to draw a lot, but since he cannot do that, we are finding other ways to get back to his creative side." Erik, his mother, and an art teacher have started scrapbooking. "His first book looked back on his time in the Army," Christine said. "We went and gathered Army stickers, cut-out articles about him, and pictures he had sent back. He picks what goes on a page and uses a stick he holds in his mouth to put them on the page." Erik has even painted a picture. "He went adaptive skiing with Wounded Warrior Project and wanted to paint something from the day. He picked the colors and used a brush while we stabilized his elbow." When Erik is not up for art, he can always go online – to listen to more of his favorite Wu-Tang Clan, or just to chat with friends. These opportunities are possible through technology and the Independence Program. To learn more about how WWP connects, serves, and empowers through programs and services that impact the lives of wounded warriors, visit http://newsroom.woundedwarriorproject.org/.